Venomous snake is any of a large and diverse number of snakes that are capable of injecting venom (modified saliva) into another organism, essentially for purposes of capturing prey or self-defense. Venom normally is delivered by means of a bite or stab using highly specialized teeth such as retractable or fixed hollow fangs, while a poisonous organism, in contrast, involves ingestion of the animal or contracting the poisonous agent through the skin. Whereas venomous snakes use venom to immobilize prey, non-venomous species either constrict their prey, or simply overpower it with their jaws. Venomous snakes include several families of snakes and do not form a single taxonomic group. Two of the most well-known families of venomous snakes are Viperidae (vipers, such as rattlesnakes and puff adders) and Elapidae (such as cobras and sea snakes). Atractaspididae (such as burrowing asps and mole vipers) also is a family of venomous snakes, and venomous members are found in Colubridae, such as the boomslang. The history of venom appears to be ancient, even predating the appearance of advanced snakes, and the number of venomous snakes today may be more common than previously thought. Recent findings have raised to more than 2,000 the number of snake species that have venom toxins and there is a suggestion that all snakes may be venomous to a certain degree, even if the venom is smaller in quantity and only delivered via sharp teeth rather than fangs (Fry et al. 2006; Zimmer 2005; UM 2003). Although the majority of venomous snakes are small innocuous creatures, many are capable of causing painful injury or death to humans. Venom in snakes is more for killing and subduing prey than it is for self-defense (Mehrtens 1987, 243). Venomous snakes play important ecological roles in food chains controlling populations of prey species, including some, such as mice and rats, that can be agricultural and household pests. Venom also is being explored for possible medicinal use (UM 2003). Venomous snakes are often said to be poisonous, although this is not the correct term, as venoms and poisons are different. Poisons can be absorbed by the body, such as through the skin or digestive system, while venoms must first be introduced directly into tissues or the blood stream through mechanical means. It is, for example, therefore harmless to drink snake venom as long as there are no lacerations inside the mouth or digestive tract (Klauber 1997). While the term "poisonous snake" is mostly incorrect—poison is inhaled or ingested whereas venom is injected (Freiberg 1984, 125)—there are, however, poisonous snakes known to exist. The fangs of "advanced snakes" like vipers (Viperidae) and elapids (Elapidae) are hollow in order to inject venom more effectively, while the fangs of rear-fanged snakes such as the Boomslang merely have a groove on the posterior edge to channel venom into the wound. Snake venoms are often prey specific, its role in self-defense is secondary (Mehrtens 1987, 243). Venom, like all salivary secretions, is a pre-digestant that initiates the breakdown of food into soluble compounds allowing for proper digestion, and even "non-venomous" snake bites (like any animal bite) will cause tissue damage (Mehrtens 1987, 209). Snake venoms are complex mixtures of proteins and are stored in poison glands at the back of the head (Freiberg 1984, 123). In all venomous snakes, these glands open through ducts into grooved or hollow teeth in the upper jaw (Mehrtens 1987, 243; Freiberg 1984, 5). These proteins can potentially be a mix of neurotoxins (which attack the nervous system), hemotoxins (which attack the circulatory system), cytotoxins, bungarotoxins, and many other toxins that affect the body in different ways (Frieberg 1984, 125). Almost all snake venom contains hyaluronidase, an enzyme that ensures rapid diffusion of the venom (Mehrtens 1987, 243). Venomous snakes that use hemotoxins usually have the fangs that secrete the venom in the front of their mouths, making it easier for them to inject the venom into their victims (Frieberg 1984, 125). Some snakes that use neurotoxins, such as the mangrove snake, have their fangs located in the back of their mouths, with the fangs curled backwards. This makes it both difficult for the snake to use its venom and for scientists to milk them (Frieberg 1984, 125). Elapid snakes, however, such as cobras and kraits, are proteroglyphous, possessing hollow fangs that cannot be erected toward the front of their mouths and cannot "stab" like a viper; they must actually bite the victim (Mehrtens 1987, 242). Certain birds, mammals, and other snakes such as kingsnakes that prey on venomous snakes, have developed resistance and even immunity to certain venom (Mehrtens 1987, 243). Over 2,000 species are known to be venomous (Fry et al. 2006; Zimmer 2005; UM 2005). This number has recently increased greatly from a few hundred as research has revealed venoms in what previously were thought to be non-venomous snakes, and although these snakes have small quantities of venom and lack fangs, the venom still can be delivered via their sharp teeth (UM 2003). Even some common pet-store snakes, such as the rat snake, were found to have venoms as complex as venoms from known deadly snakes, although this does not mean the snakes are dangerous to humans (UM 2003). The following groups of snakes can be aggressive and inflict dangerous, even potentially lethal bites. Atractaspididae. The Atractaspididae are a family of venomous snakes found in Africa and the Middle East, and include those with the common names of mole vipers, stiletto snakes, and burrowing asps. The family includes fangless (aglyphous), rear-fanged (opisthoglyphous), fixed-fanged (proteroglyphous), and viper-like (solenoglyphous) species. Molecular and physiological data linking this family to others is ambiguous and often contradictory, which means the taxonomy of this family is highly contentious. ITIS (2004) recognizes 12 genera. This family includes many genera formerly classed in other families, on the basis of fang type. The nominate family, Atractaspididae has itself been moved to and from other taxa, reinforcing the ambiguity of this family. Colubridae. While most members of Colubridae (colubrids) are non-venomous (or have venom that is not known to be harmful to humans) and are normally harmless, a few groups, such as genus Boiga, can produce medically significant bites. 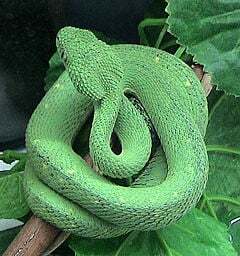 At least five species, including the boomslang (Dispholidus typus) have caused human fatalities. The venom-injecting fangs associated with venomous colubrids are almost always in the back of the mouth, compared to vipers and elapids. Elapidae. The Elapidae, or elapids, are a family of venomous snakes found in tropical and subtropical regions around the world, including the Indian Ocean and the Pacific. They are characterized by possessing a set of hollow, fixed fangs through which they inject venom. Over 60 genera and 230 species are recognized, including the cobras, sea snakes, mambas, and coral snakes. Viperidae. Viperidae is a family of venomous snakes, known as vipers, that have a single pair of long, hollow, venom-injecting fangs that can be folded back against the top of the mouth, tip inward, when the mouth is closed. Well-known members of Viperidae include such pit vipers (with heat-sensing pits) as rattlesnakes and moccasins and such true or pitless vipers as puff adders. There are about 250 species. The fact that venomous snakes are spread over several families historically was interpreted to mean that venom in snakes originated more than once as the result of convergent evolution. However, the presence of venom toxins now has been found in many more species and sub-families than previously thought and it has even been claimed that even nearly all "non-venomous" snakes produce venom to a certain extent (UM 2003; Zimmer 2005; Fry et al. 2006). This has suggested a single, and thus far more ancient origin for venom in Serpentes than had been considered. If the Toxicofera hypothesis is correct, venom was present (in small amounts) in the ancestor of all snakes (as well as several lizard families) as "toxic saliva" and evolved to extremes in those snake families normally classified as venomous. Indeed, research suggests that venom came first, then snakes evolved later, and that when snakes first evolved 100 million years ago, their venom genes were already 100 million years old (Zimmer 2005). There thus is support for the view that snakes may have evolved from a common lizard ancestor that was venomous, from which venomous lizards like the gila monster and beaded lizard may have also derived. This hypothesis suggests that all snakes have venom glands, even species thought totally harmless such as the corn snake, commonly kept as a pet. What differentiates "venomous" from "non-venomous" is the evolution of a venom delivery system, the most advanced being that of vipers, with fangs that are hinged to prevent self envenomation, curling out only when the snake strikes. Advanced snakes and helodermatid lizards (bearded lizard and gila monster) are the only two lineages among extant reptiles known to have a venom delivery system, although venom toxins now have been found more widely in lizards as they have in snakes (Fry et al. 2006). Freiberg, M., and J. Walls. 1984. The World of Venomous Animals. New Jersey: TFH Publications. ISBN 0876665679. Fry, B. G., N. Vidal, J. A. Norman, F. J. Vonk, H. Scheib, R. Ramjan, and S. Kuruppu. 2006. Early evolution of the venom system in lizards and snakes Nature (Letters) 439: 584-588. Retrieved July 27, 2008. Integrated Taxonomic Information System (ITIS). 2004. Atractaspididae Günther, 1858 ITIS Taxonomic Serial No. : 563895. Retrieved July 27, 2008. Klauber, L. M. 1997. Rattlesnakes: Their Habitats, Life Histories, and Influence on Mankind, 2nd edition. Berkeley, CA: University of California Press. ISBN 0520210565. Mehrtens, J. 1987. Living Snakes of the World in Color. New York: Sterling. ISBN 0806964618. University of Melbourne (UM). 2003. Venom hunt finds "harmless" snakes a potential danger ScienceDaily December 16, 2003. Retrieved July 27, 2008.
Zimmer, C. 2005. Clues to the origin of snake venom New York Times November 22, 2005. Retrieved July 27, 2008. This page was last modified on 19 January 2016, at 21:26.